Coaching: remote coaching is $50 per week. Face to face coaching is $100 per week. Lifestyle Therapy: remote therapy is $200 per month and includes on-going email therapy. Face to face therapy sessions: $100. Personal Training $100 per hour session. I hold certifications in multiple disciplines including ACSM Fitness Instructor, USAT Certified Coach Level 1,Certified Healthexcel Metabolic Typing Counselor and a masters degree in counseling psychology with a specialty in eating issues. I am currently working on my PhD and my dissertation interest is how 21st century Americans use endurance exercise as a tool for self awareness and spirituality. I am best known for my work at helping people lose weight and facilitating individuals in successfully adapting a lifestyle of participation in endurance events. 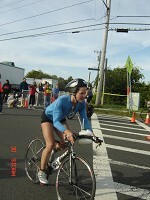 I completed my first Ironman in 2007 and have been competing for 5 years. I hold podium finishes in many races. I have also participated in Native American Vision Questing rituals Including participating in the Sun/Moon Dance which involves fasting from food/water while dancing for 4 days and Drumming/Chanting rituals involving fasting for 3 days and see many similarities to triathloning. Success. Coach Judy Torel has been notified of your message.